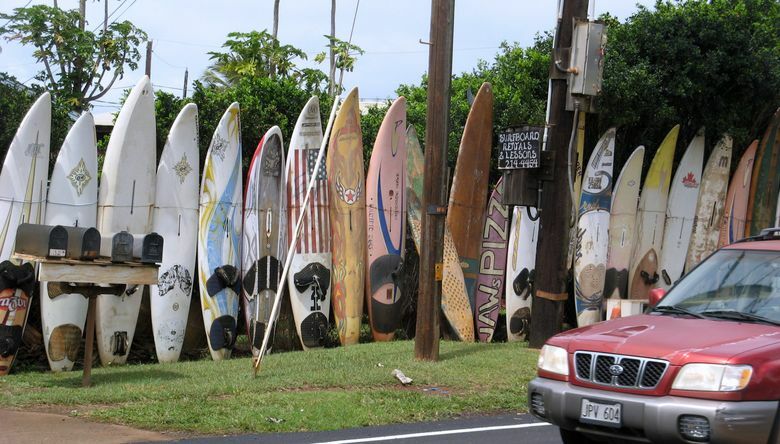 Away from the corporate hustle, beach culture meets old Hawaii on Maui’s North Shore. If you want to see buskers, locally owned shops and galleries, champion windsurfers on the water and snoozing sea turtles on the beach, ditch the West Maui resorts. Head for Pa‘ia, on the island’s North Shore. You won’t find McDonald’s (historic Lahaina has one) or Safeway (ditto). 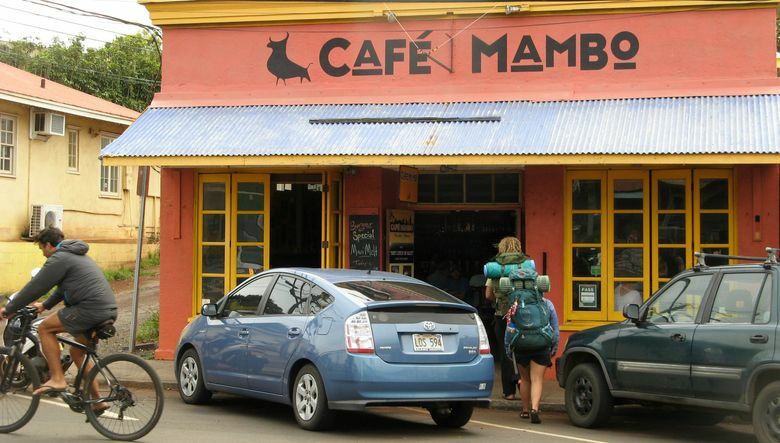 But Pa‘ia’s little eateries — such as Café Mambo, Café des Amis or Pa‘ia Bay Coffee — will feed you just fine with no cookie-cutter look or feel. And Mana Foods, the town’s only supermarket, is one of the best natural food stores in the islands, with more than 400 local vendors. Pa‘ia has not gone undiscovered, and being on the famous road to Hana hasn’t helped it keep a low profile. Arrive before 10 a.m. to dodge crowds and find the easiest parking. A free, no-time limit (so far) county lot is off the Hana Highway on the west edge of town as you arrive from Kahului. Up Baldwin Avenue, there’s a pay lot near the post office. Stay nearby and enjoy the town in morning and evening when crowds are in West Maui. We stayed at Ku‘au Inn B&B, a stately old sugar-plantation home a mile east of Pa‘ia. Close to the busy road, but with lots of charm, including outdoor showers; from $145 a night, kuauinn.com. In the center of town, with some ocean views, is the stylish Pa‘ia Inn, paiainn.com. Start early on the road to Hana and stop in Pa‘ia for provisions at Mana Foods or the Hana Picnic Lunch Co., hanaheadquarters.com. On the hunt for souvenirs? 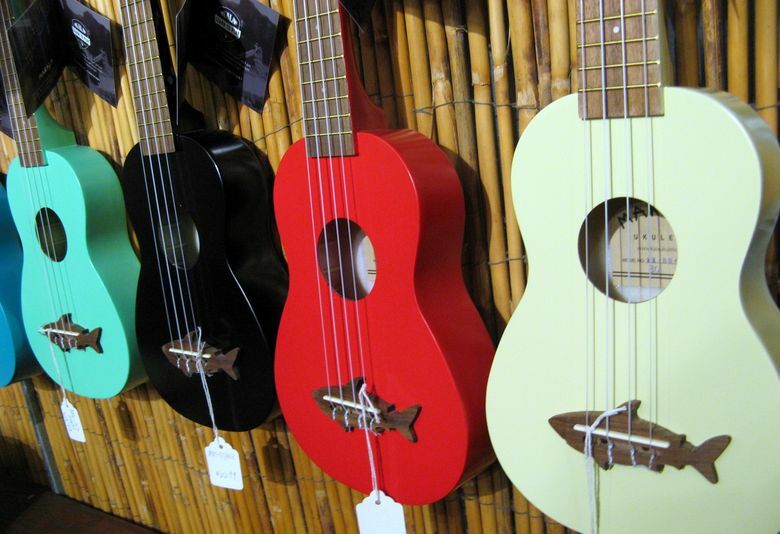 Who needs ABC Stores (the Lahaina area has five) when Pa‘ia’s Alice in Hulaland, 19 Baldwin Ave., carries an astonishing array of Hawaiiana kitsch — and more than 50 ukuleles on sale, in everything from bubble-gum colors to seriously crafted local woods, $66 to $439. The place’s history is rooted in sugar production. The Pa‘ia Sugar Mill, in business here from 1880 to 2000, brought workers from as far away as China, Korea, Portugal and the Philippines. 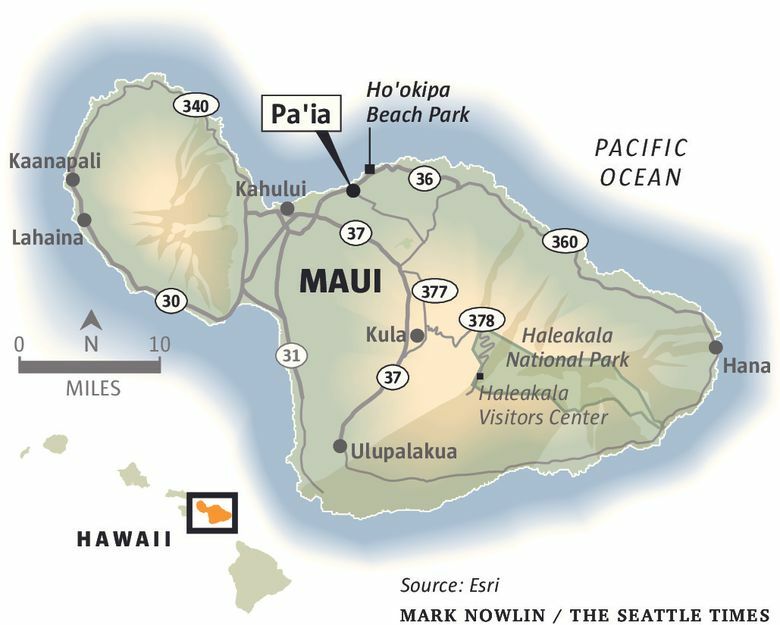 In the early 20th century, Pa‘ia was the population center of Maui. But by the 1950s, workers started moving to the new so-called “Dream City” of nearby Kahului, home to today’s international airport. In the 1960s came the newly arriving sons and daughters of the Flower Power movement who were looking for some place different, and saw charm in Pa‘ia’s plantation-style, false-front buildings. It became known as Maui’s hippie haven. To this day, the town retains that influence of harmoniously mixed ethnicities and laidback lifestyles, which blossomed anew with the influx of beach culture when windsurfing took hold in the late 1970s. One spinoff of the surfing vibe: Pa‘ia has grown a reputation as Maui’s place to buy a locally made bikini. “There are lots of free spirits, lots of out-of-the-box ideas,” Sugata told me over coffee at Sip Me, one of the homegrown coffee shops in this town with no Starbucks. • A wiry old man wearing only his board shorts, Joe Cool shades and long, graying dreadlocks, looking tougher than the leashed, well-muscled hound he walked up one side of the street and down another. In this town of no worries, it might be easy to forget such a detail. Even the turtles seem to have taken a chill pill on Maui’s North Shore. As rain showers fell around noon one day, my wife and I pulled our rental car into the unmarked parking lot of a tiny beach park off the Hana Highway just east of Pa‘ia. With a close-up view through our windshield of sand and spearmint-green surf, we ate a sack lunch and watched local kids giggle in the waves with no worries about the warm rain. We sat for 20 minutes before realizing that the large “rock” the kids and their frolicking dogs had been running past, not 50 feet from us, was actually a green sea turtle, the size of a large foot stool, hauled up on the beach for a rest. I got out of the car, walked the length of the short beach and counted 22 turtles siesta-snoozing on the sand. It’s a common sight on this stretch of coast. 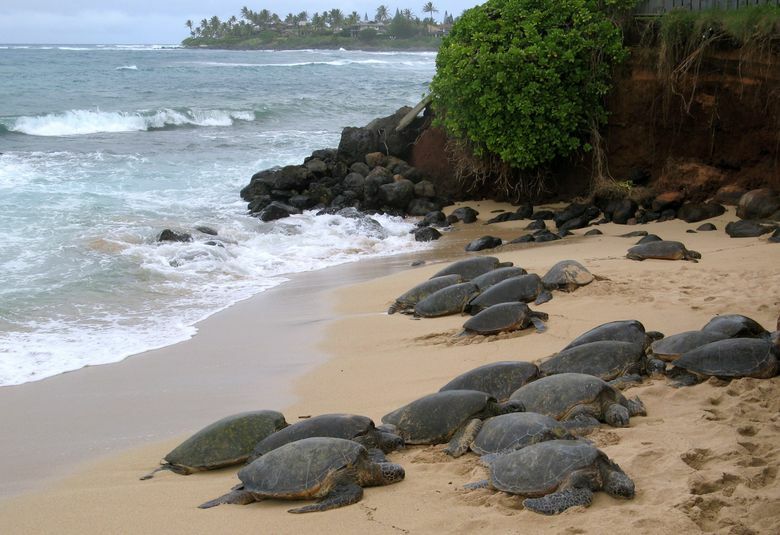 Beaches nearby at the renowned Mama’s Fish House and at Ho’okipa Beach Park also collect turtles, perhaps resting from their own adventures in the surf. Give them respectful distance, take only long-lens photos (no perching your kids on turtles; they’re not ponies) and everyone’s happy. Turtle-watching aside, it’s a rare day you can’t catch world-class windsurfers in action at Ho‘okipa, 2.3 miles east of Pa‘ia’s sole traffic signal. A spectrum of sails adds to Maui’s natural tendency to create rainbows. Come in the fall to see pros compete in the Maui Aloha Classic, a stop on the International Windsurfing Tour, Oct. 28-Nov. 10, 2018. In a shopping mood? Poke your nose in at Maui Hands gallery, 84 Hana Hwy., which represents some 300 local artists and carries shell leis made by Native Hawaiian residents of the remote, restricted island of Ni‘ihau. • Nuage Bleu, with women’s and kids’ wear. My wife liked the kids’ beach wraps that can be worn like a cape, with bunny or monster heads. • A shop called Sun Showers, with a hula-girl onesie for a toddler. • Jaggers, with “made in Hawaii” Aloha shirts for $35, or a kids’ “cabana set” of shorts and shirt for about $20. 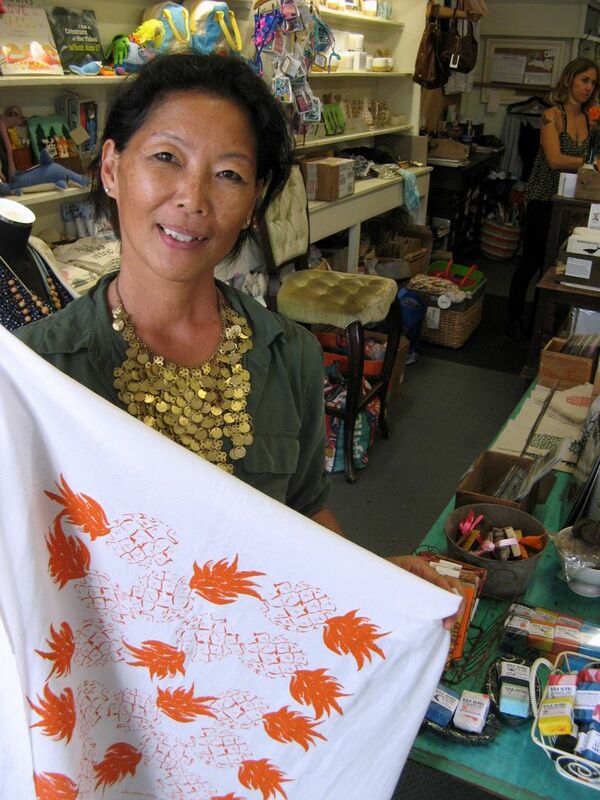 • Biasa Rose, with home décor and women’s wear, in business here for 26 years. I liked the woodcut Hawaiian alphabet book by local artist Caroline Killhour and New Yorker Brendan McBryan. • Or at Kiwi John’s, pick up a T-shirt claiming “A Shark Ate My Homework” ($36). Popular places to eat include Milagros Food Co. (“gourmet Southwest food”), Pa‘ia Fishmarket, and Flatbread, a pizza joint we found hard to get into because it’s so popular. We liked Cafe des Amis, 42 Baldwin Ave., where the 4-6 p.m. happy hour included half-price cocktails, including the Lilikoi Margarita (usually $9.95). We enjoyed a curry dish with rice, butternut squash, spinach and chickpeas, $13.95, served at lacquered wooden tables in a covered, open-air courtyard beneath potted palms. 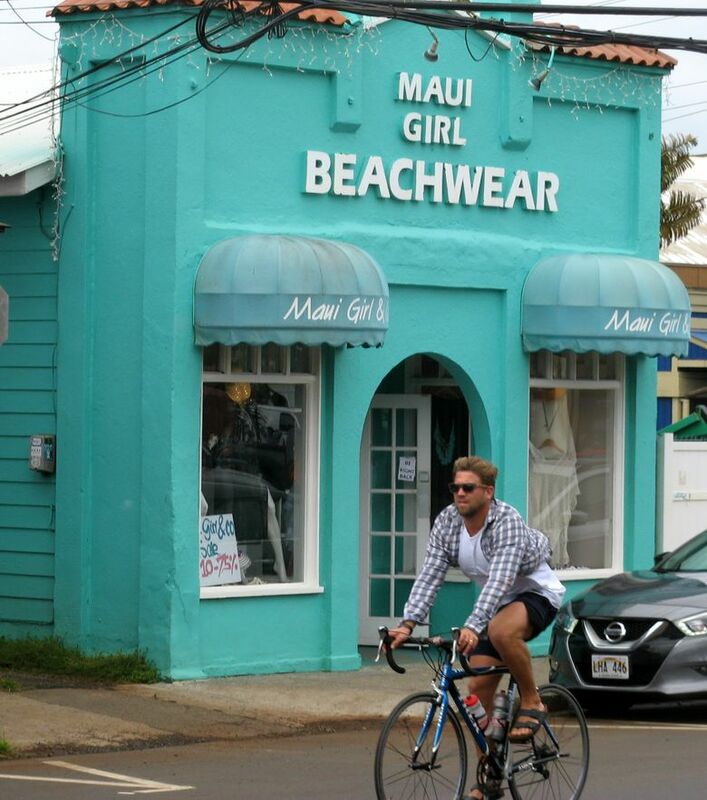 A relatively recent addition to the town is a tiny storefront called POME (“Product Of My Environment”), whose sign advertises “Surf — Yoga — Cafe,” at 151 Hana Hwy. 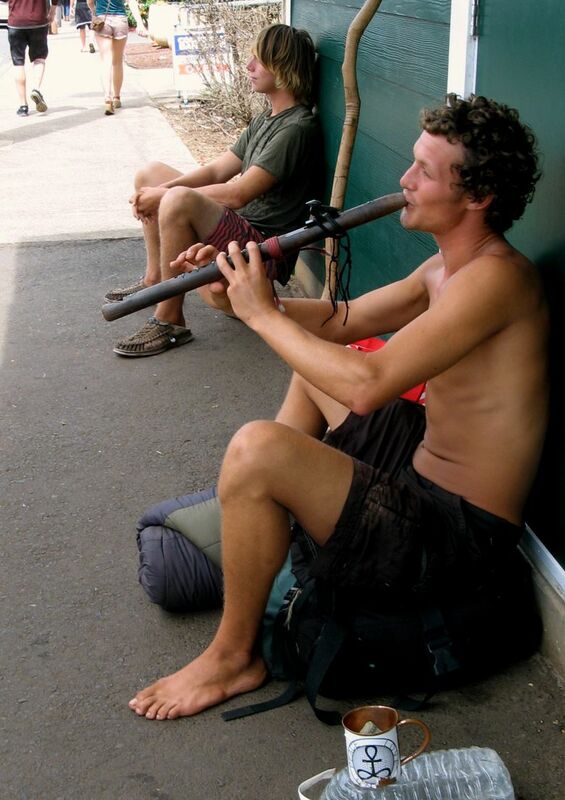 That’s the new Pa‘ia, perhaps: multitasking, but in a very tranquil kind of way.